07.10 - At the international Dogshow "Belarus Summer 2006" our chinese crested dog Golden Medaillon von Shinbashi (Dolly) and our dogue de bordeaux Bakervill's Style Viski have won the show and got CACIB/BOB. 06.25 - Our chinese crested dog Golden Medaillon von Shinbashi (Dolly) has won at "White Nights" in St-Petersburg and got CACIB. 06.13 - Our dogue de bordeaux Bakervill's Style Viski has won the intermedia class at European Winner Show in Helsinki, also he has won the intermedia class at Finnish Club Match. 06.12 - At European Winner in Helsinki our chinese crested dog Golden Medaillon von Shinbashi (Dolly) has got second place in the open class. 28.05 - At the dogue de bordeaux Club Match 2006 in Moscow our dogue de bordeaux Viski has won with ВОВ and became Russian Club Champion. 24.05 - Our dogue de bordeaux Bakervill's Style Viski is in Moscow again! 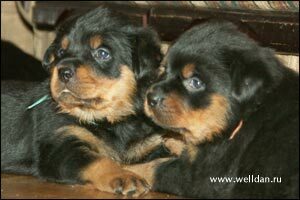 20.05 - Pictures of rottweiler puppies from Rotti's Allyans Vico are placed on the site. Puppies of the previous litter from Vico you can see here. 09.05 - Our chinese crested dog Golden Medaillon von Shinbashi (Dolly) has won the monobreed show in Moscow with BOB and became Club Champion. On the all-russian show at the same day Dolly has won the champions class and became Bulgarian Champion. 20.04 - A litter from Rotti's Allyans Vico is born. 09.04 - New pictures of rottweilers Vico and Frigga and our dogue de bordeaux Kuba. 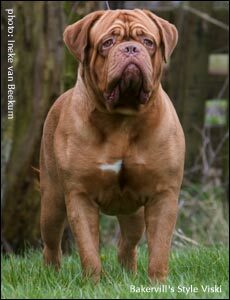 18.03 - Our dogue de bordeaux Bakervill's Style Viski has won the international dog show in Goes (Holland) with CACIB and BOB. Viski was in the champions class. 05.03 - At the International Dog Show in Zuidlaren (Holland) our dogue de bordeaux Bakervill's Style Viski has won the champions class. 30.02 - Our young rottweiler female Frigga v.d. Crossener Ranch, imported from German kennel Crossener Ranch, is 7 months old. 26.02 - Our dogue de bordeaux Bakervill's Style Viski has won at the international "Flanders Dog Show 2006" in Gent (Belgium) with CACIB and BOS. Viski was in the champions class. 26.02 - At the international dog show "Eurasia" in Moscow our chinese crested dog Golden Medaillon von Shinbashi (Dolly) has won the open class with CAC. 10.02 - New publications in Russian: series "Legendary Rottweilers", Willian Campbell Tests for pup behaviour. Dogue de Bordeaux Story, Standard of Dogue de Bordeaux in English. Famous German Rottweiler Kennels, Descendance of the Chinese Crested.